One of Jarrett and my favorite things to do is going out for a day of paintball. 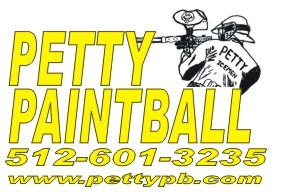 Our favorite place to play at is Petty’s Paintball. Petty’s is a small family owned field located between Lockhart and Bastrop just south of Austin, TX. Both of us have been playing paintball for many years, but I’ve been playing longer than Jarrett. However, we both love the sport and play whenever we get a chance. One nice thing about Petty's Paintballs is that they host large games called scenarios. Scenarios are continuous games that are played for multiple hours generally in some sort of wooded area. 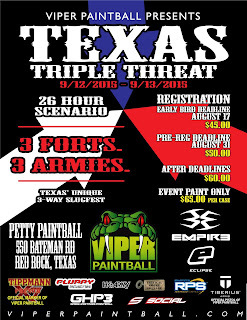 Jarrett and I are planning to go to a 26-hour scenario hosted by Petty’s and Viper who is another scenario organizer. BeeGee might make a guest appearance, but she won’t be playing because the noise spooks her. The upcoming scenario has three forts with an army of about one hundred people per team on twenty-six acres of wooded awesomeness. Petty’s also does shorter big games all year round that are generally six to eight hours long. Jarrett and I went out to see some old friends and to start prepping our equipment so it will be up and running for the big game. Plus, it’s always fun to get in some play. Jarrett built a rocket launcher many years back so we could go ham on the opposite team in the scenario games. The launcher was in pretty rough shape since it’s been at least five years since anyone has touched the thing. Luckily, we got it working with the help of a master genius Mr. Petty. Once that happened, I got the great idea to build another rocket launcher, just ten times better than the old one. After tinkering with the launcher for a bit, 3 guys showed up to play that morning. They ended up being really awesome and super fun to play with. We had not had that much fun playing in a long time. Because there were only five of us, it made the teams a little lopsided. Thankfully, they were cool with letting Jarrett and I play together because we hadn’t played together in such a long time. Jarrett and I were worried somewhat about playing with them because we are pretty OG and veterans of the sport, while they had only played a handful of times. It didn’t help that they were using rental gear, but it all turned out ok and everyone had fun at the end of the day. We started the day playing on the speedball fields first. 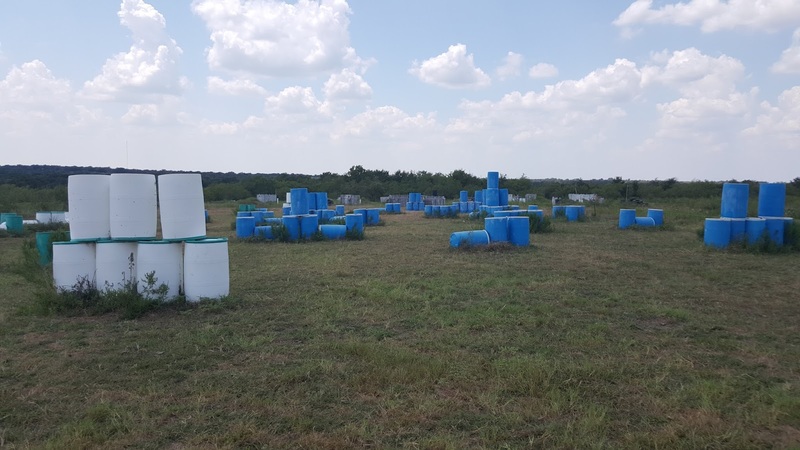 Speedball fields are small fields with walls or as we like to call them bunkers, which are equally spaced and mirrored on both side to make the field as fair as possible. 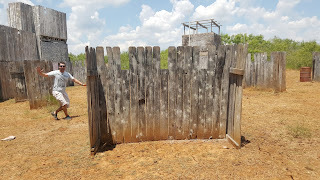 We played quite a few games on a few different fields. Plus we switched up teams here and there. After an hour or so of play, we decided to take a break because the heat was so bad and some of us needed air and paint. 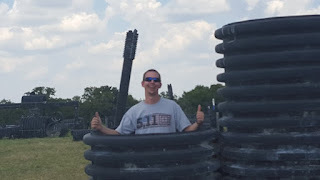 While in the staging area, Jarrett and I asked the guys if they wanted to go and play some woods ball, which is what it sounds like. 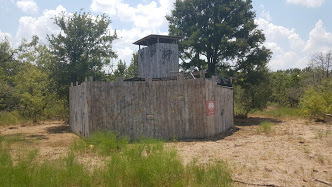 Paintball in the woods is just running around in the woods and sometimes bunkers are randomly thrown about. This is where Jarrett is most at home sneaking around like a tiger waiting for the right moment to go ham on his opponents. Unfortunately, I fell victim to him a few times and was unable to handle it. We decided to take another little break because of the heat. Plus one of the guys liked running around wild like and sounded like he was going to die. While on our time out, Jarrett had a Godzilla-sized spider hanging out on his leg so I attempted to shoot it off. I got the spider but clipped Jarrett in the leg making him a little upset. We had so much fun with these guys and they ended up being solid sports so we decided to invite them to come play with us in the Viper game on September 12th to the 13th. We invite everyone to come and play with us. Everyone is welcome with the BeeGee crew. If you are not able to make it to the viper game, we will be doing a post about it so you won’t miss out on any of the action. Make sure to keep up to date on all our adventures by following us on Facebook. Triple Threat this weekend. I'm excited! I am looking for a best paintball gun. 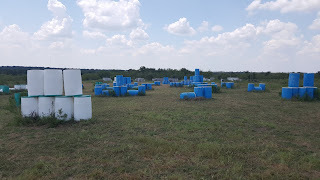 Can you share some paintball guns here? I'll let Jack provide you some answers. He is the paintball expert. Most of that comes down to personal opinion but Bob long, luxe, Empire, and BT. I have seen these brands do very well. Although most of these brands are a little more expensive than most people can afford. So a BT-4 and empire axe in our opinion the best paintball gun for your money.